It's time for a new challenge at House of Cards-Enamel Dots. If you don't have these in your stash be sure to check out the video that shows you how to make them. I used some from Bo Bunny. The stamps for this card are from Stampin' Up (sentiment, and behind sentiment), Close to My Heart (Tech Speak), and the numbers are from Inkadinkado. 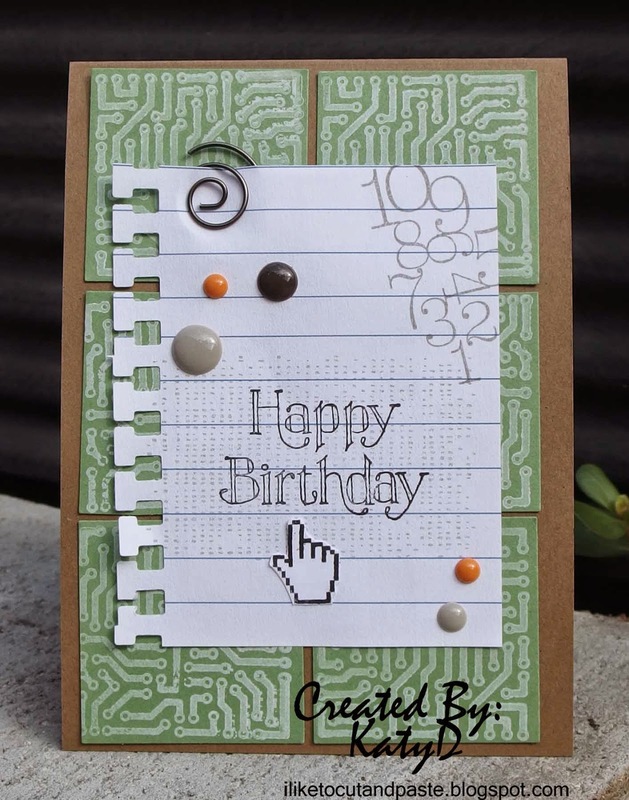 This card is for my dad-he's a computer guy so I hope those green squares look like circuit boards to him. I used a white ink from SU for those and my 2 inch square punch. The kraft background for the card is 4x12 then I folded it in half. I know it's a different size but that is the only way I could get the circuit board squares to look ok. I used a fiskars punch for the notepad paper. The notebook paper was inspired by this pin. Thank you for stopping by! We can't wait to see what you make with Enamel Dots! I love your enamel dots color and how clever to make that circuit boards for your dad´s card...he will love this...may I ask you which stamp is it that green circuit board you have used..I want to buy it...I adore all the look on your card really manly..if you search SEIZE THE BIRTHDAY challenge they have now Masculine theme you can join there too dear Katy..
How perfect for a computer lover! Great masculine card Katy! Have a great Sunday, teamie! This is awesome! LOVING the colors and the 'clicking' hand!!!!! This is a great male card. Super cool card. Love your enamel dots and the circuit board look. Great masculine card Katy! Love your use of the enamel dots! Judy HOC teamie! Fabulous! LOVE the squares and that patterned paper! And so clever with the notebook paper!!! Totally looks like circuit boards--very cool! Hi Katy! Love this 'geek' card! I will definitely have to CASE it because I have a daughter and SIL who are both computer 'geeks'! Super cute! Have a great day. I sure your Dad will love it, that circuit board stamp is awesome. I know my geeky husband would love your card, so I think your puter dad will also! This is awesome Katy, I love circuit board background!! I love this cute design - -the notebook paper is super cute! Very cute card! What a fun masculine card! Love it!